Being reminded in our article The Experienced Wedding Guest that a wedding is as much about the bridal couple as it is about the guests, we have put together 10 of the best wedding ideas that we’ve come across over the last few years. Some of these were experienced at Waterkloof Wine Estate, while others were found on our quest for unique, fun and memorable wedding ideas. We have seen huge success with Marimba bands playing at weddings, either as the bride walks down the aisle, during the photo shoot or at the reception as the dancing band. Marimbas provide a very warm and truly African sound that is beautifully unique. It has the power to really uplift the atmosphere and put a smile on your wedding guests’ faces. This is a proudly African wedding idea. Collect photos of family and friends and put them in a frame as a place setting for that particular person. This works very well for smaller, more intimate weddings and your guests will feel so nostalgic and appreciated. Another nice touch is to write a small personalised note on the back of the photograph for example, “Hi Mike, thank you so much for joining us all the way from the UK”. Such a fun wedding idea. A lovely wedding idea that we came across at one of the weddings held at Waterkloof is to place a glass bowl with pens and cards inside at the reception so that guests can write and share their favourite memory of the bridal couple. A great twist on this is to tell your guests to write something that you will only read in a year’s time on your 1st anniversary. A beautiful and natural way to decorate your tables is to twist wire in the shape of the table number and wrap olive leaves, vines or creepers around them. 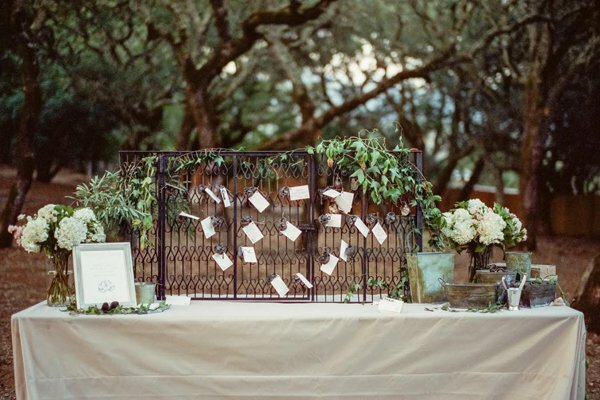 Table numbers made from olive branches look exquisite and are a stunning wedding idea. Another gorgeous wedding idea is to have a miniature recreation of the locks on Paris’s Pont des Arts. The bridal couple supplies a number of locks, each with a tag to be written on. The locks are then secured on a wire frame by the guests, all with personalised messages to the bride and groom. The guests can then keep the key to their lock as a wedding keepsake. South Africa has an abundance of very talented local artists, from painters to beaders to ladies who sew and crochet. Why not scout out your area to see whether you can find one to perhaps make you beaded Proteas as your bouquet or small beaded animals as a gift. To pay it forward even more, attach their name, number and story to the gift so that should your guests need the same services they know who to call. A small marketing initiative that could really change someone’s life. In a wonderful twist to the traditional young flower girls, why not make your grannies walk down the aisle ahead of you (If you’re fortunate enough to still have them around). We saw this done and it provided a fantastic talking point for almost the entire wedding and the grannies themselves couldn’t wipe the smiles off their faces. We all know that dancing the night away in stilettos is not really that practical. To help your guests out, why not provide a basket of flip flops in a variety of sizes next to the dance floor so that they can dance the night away, blister free. They can then take these feet-savers home as keepsakes. This is a wedding idea that I love. Wedding ceremonies of today are often shorter and more relaxed than the traditional wedding ceremonies of decades ago. One cool idea is to have quirky cue cards at the ceremony. The MC stands at the front of the church holding cards such as “laugh now”, “breathe”, “wipe your tears” up to the congregation. It is a wonderful way to relax the atmosphere. But be sure to choose your wording and MC wisely! This wedding idea is popular and still one of my favourites. Naming your tables after places you have been to together or that mean something to you is a wonderful way to document your Love Story. These table names can be anything from the street name where you first met to the restaurant where you shared your first date. Providing an explanation at each table is also a lovely addition. These are our 10 favourite wedding ideas, but there are so many more ideas out there that are truly unique and magical. Tell us your ideas for your upcoming wedding! Visit our weddings page and fill in the enquiry form with some of your great ideas. For more ideas on wedding planning and wedding venues, take a look at Waterkloof Wine Estate. Waterkloof hosts many weddings per year and is an awe-inspiring Cape Winelands Wedding Venue to celebrate your dream wedding at. Professionalism, style, elegance and sophistication are all synonymous with Waterkloof Wine Estate.